We’ve had an update this week from freelance scenic artist, Alice Bolton, who is out in Barbuda. 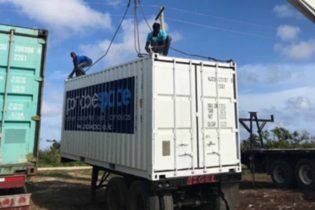 Alice managed to fill two containers with donated materials and tools to help the people of Barbuda take the first steps in rebuilding begin their community after the terrible destruction caused by Hurricane Irma. This report comes from her colleague, Zoe Parsons. 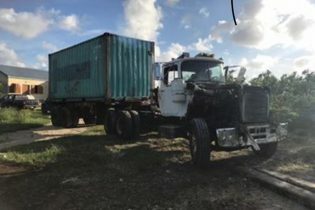 ”I thought I’d give you and the team an update on the materials and tools you sent to Barbuda. Alice arrived last week and met the containers in Antigua. After a long slog and lots of hard work I’m at very glad to report both containers and all their contents have arrived safely in Barbuda! It was a complicated process for Alice getting them on to a barge and transporting them. As you can see in the photos, there isn’t much left of the island’s tractor after the hurricane, but it did the trick! A friend and resident Asha Hope has been orchestrating a clean-up team and I hear from her that the most the homes have now been cleared, so the containers have arrived just in time to start repairs. If you would like to make a donation, please click on the link above.